Oftentimes dinner at our house is as simple as pizza and a salad. Lately, I’ve been throwing together a simple tomato and avocado salad that my cousin-in-law showed me how to assemble. (He and his sweet wife came and cooked dinner at our house when our family member was sick back in December- how nice is that?!) They made chili, cornbread, and this salad, and I’ve been eating it regularly ever since. 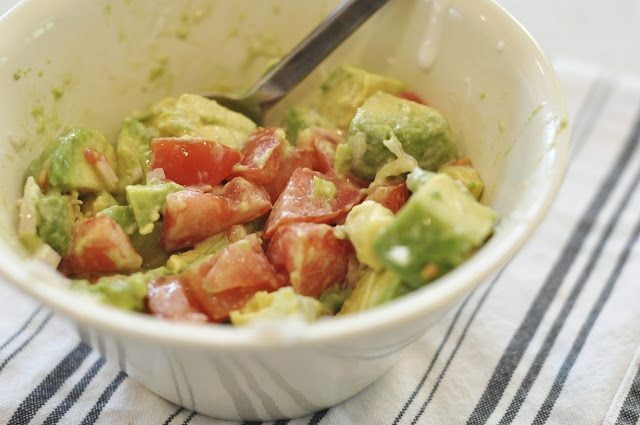 The salad is simply a combination of diced tomato, avocado, red onion, a bit of light ranch dressing and a dash of creole seasoning (which I leave out sometimes). Super easy and delicious. The only problem I have with this dish is using the avocados before they go bad! (I also love to order pizza from our favorite pizza place). Is it weird that James likes pepperoni at two? He always goes for it first. But he won’t eat the things I associate with most kids, like hot dogs, burgers, or chicken nuggets. Mama also ate the leftover pizza. p.s. my husband didn’t starve- he was out of town! P.S. I’ve gotten so many wonderful comments and questions from you about my pregnancy weight loss journey that I plan to write a follow-up post soon to share my progress with you and how I’ve been able to (finally) reach my goal! Thank you so much for sharing your stories in the comments and emails to me. It makes me feel so much better knowing that we can relate to and encourage each other. If you are still struggling, you can do it. My kids just will not touch avocado! It's crazy! Love the avocado and tomato salad. So delish and healthy. Thanks for sharing the salad! Hubby is out of town, so this will be perfect for me for lunch or dinner (Kate won't eat tomatoes or avocado, despite the fact that she is a veggie fanatic). We LOVE pizza at our house. 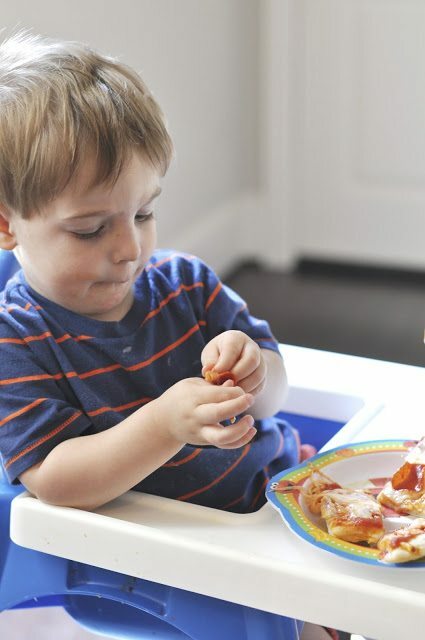 My kids were not "normal" eaters when they were little either…they were really healthy eaters, preferring fruits and VEGGIES of all things! I don't think my oldest ate a hamburger until she was in elementary school and neither one really like them now. Chicken is a whole other ballgame!! I am not a huge fan of avocado but this sounds really good. Especially paired with ranch dressing. I might have to give it a try. I know what you mean about using avocados before they go bad though. It's so tough to catch them in the stage between too ripe and not ripe enough. That salad looks so good! Must make. And James is a good eater! One word: YUM! The salad and the pizza look delicious! I love it when my kids won't eat "normal" kid food. My oldest won't eat a french fry or nugget for the life of him. But if I put asparagus on the table, he's all over it! 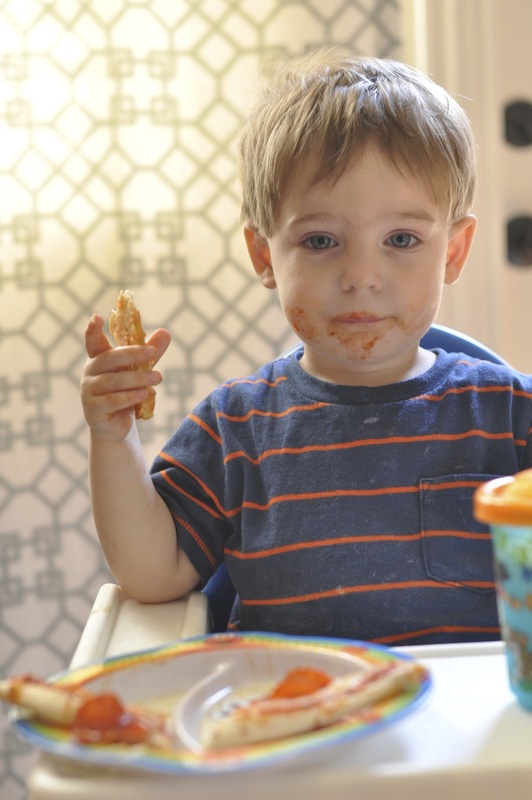 I'd MUCH rather have children who eat like that! 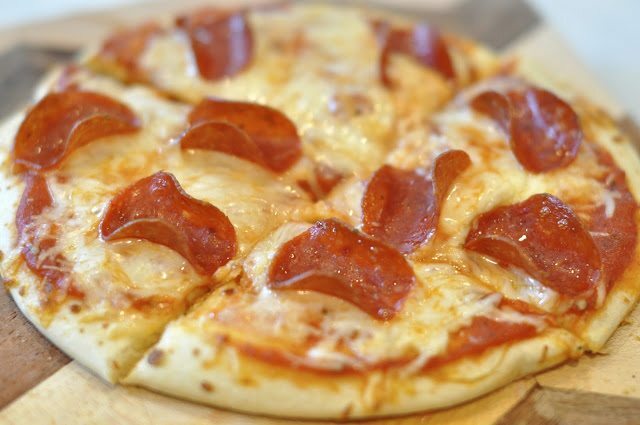 Homemade pizza looks yum – I think you just planned my menu for dinner tonight! The avocado salad looks so good, fresh and healthy. Yum! I can't wait to read your post-pregnancy fitness update. Actually, that is how I found your blog through Blue Eyed Bride. I'm 15 weeks pregnant with my first and have been curious/anxious about my post-baby body. You have given me lots of hope and inspiration that it can be done with enough hard work and healthy choices! Thank you! That salad sounds SO good! I love your blog, so much inspiration to live beautifully. A couple of months back I saw this pin on Pinterest that you might find useful on how to freeze avocados. I have not tried it out yet but I think I might now after I try this salad. Check it out. Look at that sweet face! That salad looks delish! Much better than the cereal I eat when John's working late! The pepperoni is not weird at ALL! My boys have eaten hummus, salsa, Indian, sushi, etc., since they were babies. In fact, we have a photo of my oldest eating spoonfuls of pico de gallo at 11 mos.! DH established a family "rule" before our boys were born: when we go to an ethnic restaurant, we all order the food from that ethnicity. No hot dogs and french fries at On The Border. No pbj at an Indian restaurant. Now that they're older (8 and 10), we're a tad more lenient since sometimes you just feel like a big cheesy burger when the rest of the family wants, say, a build-your-own burrito. But in general, it's worked out great because they try almost ANYthing and like almost everything!